Education equity has become a hot topic worldwide. As a country consisting of Han majority and 55 minorities, China has made efforts to ensure education equity between the Han majority and the ethnic minorities. China’s minority education gained momentum since 1980s. In Tibet, for example, dropout rate decreased, literacy rate increased, and more Tibetan students went to colleges. As a part of minority education, bilingual education policy for minority students has been in effect for decades. I have been curious about what bilingual education looks like in Tibetan-speaking areas. My conversations with a friend made me reflect on this issue again. At a friend’s party I met a guy. He was a third year Ph.D. student studying engineering in the United States. I was so exited when I learned that he was from rural Tibet. He was the first person I know who was born and raised in a Tibetan ethnic autonomous region. I had millions of questions to ask him. When the topic came to education, to my surprise he did not talk about of the lack of facilities or poor teacher quality. Instead, the first issue he brought up was how bilingual education in his village hindered the potential of the kids. “In my village, bilingual education is not as glorious as one usually imagines”, he said, “Tibetan is the medium of instruction in primary schools, but all of a sudden, the language of instruction switches to Chinese when it comes to middle school. It caused a lot of problems for me”. According to him, both of his parents were Tibetans, so neither of them could help him learn Chinese. He also considered language as part of culture. “I really appreciate my culture. Tibetan identity and language means a lot to me. I cannot throw them away. As I know, some of my friends chose to attend schools in India where we can use Tibetan throughout schooling”. My friend’s case is not uncommon in ethnic autonomous areas. 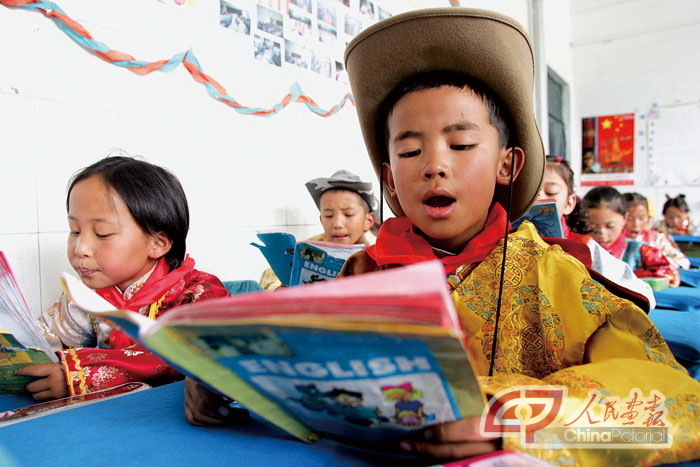 For example, the program for educational development of Qinghai (2010-2010) promulgates bilingual education—Chinese is the main and instructional language, and Tibetan a supplementary language. However, people have different notions about the relationship between the Chinese language and the Tibetan language teaching in school. The sudden switch from minority language to Chinese causes much problem for minority students. Although in lower grades Chinese is taught as a second language, many minority students do not have the Chinese proficiency to attend Chinese-language-only schools. The same situation is in Tibet. Although most primary schools still use Tibetan as a medium of instruction, Chinese is the language of secondary school and the ticket to non-farm sector employment. This causes high dropouts rates in junior secondary school, which decreases the learning potential of many students (Postiglione, 2008). Chinese policy attempts to popularize Chinese and minority language. There was a significant commitment to minority language maintenance and bilingual education in China’s language laws from 1905 to 2005 (Ross, 2006). However, problems exist. Even though bilingualism promotes Chinese as well as minority languages, the focus is always Chinese. In addition, although minorities are granted equal status with the Han language by law, Chinese is the official language that has legitimacy. Furthermore, reward mechanisms favor Han speakers, because it is easy for Han speakers to find better education and lucrative jobs. For example, most Chinese universities have Chinese language exams for minority students. Like my friend said, many Tibetans believe that their indigenous language should be the medium of instruction as Tibetan language is integral to Tibetan culture. As a result, as my friend witnessed, many Tibetan families send their children to India where Tibetan can be used as a medium of instruction. Contrary to indigenous people’s beliefs, policymakers believe in their own cultural superiority, which includes their language. Bilingualism has become uni-dimensional, instead of multi-dimensional. That is, minorities adjust to the majority by learning mandarin Chinese. The other way around, there is no learning of minority languages on the part of Han majority. It seems to me that the minority education policy tries to help the minorities, to patronize them. Policymakers think there is nothing for the minority groups to give back in terms of education—what policy does is help the minorities. With such a patronizing attitude, I don’t think educational equity can be achieved. Right now I think the minority policy aims to serve Han people in Tibet. Most officials in Tibet are Han. If children of Tibetan officials learn good Chinese, they get the ticket to a bright future, such as government jobs. Nevertheless, for Tibetan students, Chinese is not as important as Tibetan language. Thus I think the current bilingual policy favors just one group instead of both. Bilingual education policy in China has produced positive educational results, as proved by many educators, but to my mind, there is still room of improvement. Nima, B. (2001). Problems related to bilingual education in Tibet. Chinese Education and Society, 34, 91-102. Postiglione, G. A. (2008). Making Tibetans in China: the Educational challenges of harmonious multiculturalism. Educational Review, 60, 1-20. Reblogged this on Different Perspectives.